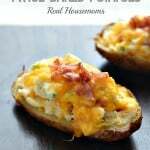 Bacon Jalapeno Popper Twice Baked Potatoes combine the amazing flavors of bacon, cheese, jalapenos and potatoes! How could you go wrong? *if store for later, wrap tightly with plastic wrap after topped with remaining cheese and place into a freezer zip top bag.